Did you know that you can reduce your own environmental impact, save energy and optimize your indoor air comfort? Your air conditioning will run at maximum energy efficiency when it is clean. Your ProgressiveMedia filter not only keeps the dust down in your home, it keeps dust and dirt off HVAC component parts optimizing heat transfer. In the quest for better energy efficiency, buildings and homes are more tightly built these days, which has had an unexpected result: more polluted indoor air. In fact, indoor air can be as much as 100 times more polluted than the air outside. Dust, dirt, pet dander and hair, pollen, bacteria, viruses, mold, car exhaust particles, odors (a complete list of what might be in the air might seem to be endless) get stuck inside with no way to escape. Herein lies the problem: how do you get rid of a wide spectrum of pollutants and still keep your structure air tight? 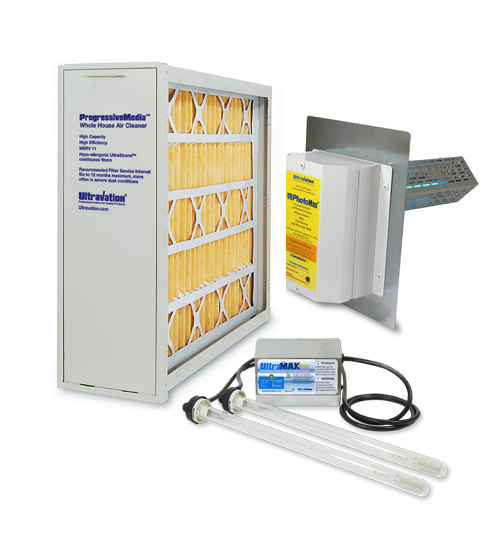 Air Filtration is the first line of defense to remove particulates. The ProgressiveMedia™ MERV 13 air filter will capture 90% or better of particles 3 to 10 microns in size. This includes pollen, dust and pet dander. It also captures 75% of particulates as much as ten times smaller (0.3 microns) like tobacco smoke and auto emissions. Removing this much contamination from the air is clearly good for your health. But there is a second less obvious benefit: it keeps the interior of the HVAC system very clean, which allows it to operate at top efficiency. And it’s also good for your wallet because you save on energy and maintenance costs. A MERV 13 will also start to collect some large bacteria and mold, giving you a head start on the reduction of pathogens, but this is where second line of defense really takes over. Germicidal UV Treatment addresses biological contamination, in the form of mold, bacteria and viruses, that are so small they can pass right through an air filter and continue circulating through the HVAC system. And because an HVAC system is notoriously wet inside (part of its job is to dehumidify), it becomes a refuge for bio-contamination. Mold, the most commonly found bio-contaminate, will release spores into the cooled or heated air supply. The three worst aspects of this are: 1) increased mold allergen in the air you breathe, 2) increased energy use as the growing mold insulates the HVAC cooling coils, and 3) the potential need for costly chemical cleanings that are bad for the environment. Ultravation® UltraMAX™ UV Lights use the natural power of ultraviolet light to disinfect HVAC interior surfaces – especially the cooling coil and the drain pan – as well as the passing air. It disrupts the DNA of pathogens, making them unable to reproduce and ultimately harmless. So as the second line of defense in the fight against indoor air pollution, the UltraMAX™ system plays a double role. It bathes the HVAC interior in continuous UV light to prevent bio-growth on the coil and other surfaces, which prevents the air conditioner from contributing to the concentrations of pathogens in the breathing air. Due to its placement in the airstream it also works to kill airborne pathogens passing through the system, causing a gradual reduction in the airborne pathogens throughout the building. The third line of defense is in pursuit of even smaller troublesome airborne matter, literally reaching the molecular level in size. Enter the Ultravation® UVPhotoMAX™. Technically, it goes like this: When titanium dioxide (TiO2) is exposed to UV light, highly reactive molecules called superoxide ions are formed. These ions are very useful. They react beautifully with odor molecules that are generally VOCs (or volatile organic compounds), oxidizing them by “stealing” their electrons. The reaction causes the odor molecule to break apart and reform into simpler molecules —mostly CO2 and a little water vapor. The creation of the superoxide ions and the reaction with odor molecules is known as photocatalytic oxidation (PCO). UVPhotoMAX does even more than odor reduction. It is active against all organics, which means this stage imposes more air disinfection and a third assault in our system against viruses and bacteria. You see, the UVPhotoMAX’s internal UV lamp emits UV in two frequencies within the UV-C range: 254 nanometers for DNA break up and a very small (and adjustable) amount of 185 nanometer UV to team up with and reinforce the superoxide ions. The 185 nanometer UV light reacts with oxygen, forming a field that surrounds the UVPhotoMAX module, disrupting organics and boosting PCO effectiveness. Using the powerful combination of ultraviolet light technologies, air filtration and a little chemistry, Ultravation professional indoor air quality products enable you to address the entire spectrum of contamination of indoor air. By working with your HVAC contractor or a member of our nationwide team of Ultravation Authorized Contractors (click here to find one in your area), you can find the right combination of products to create a comprehensive air quality system with a triple defense against pollutants. Because as everybody knows, sometimes the best defense is a great offense! To learn even more about these systems, visit Ultravation.com or contact your local HVAC contractor. How can I make my indoor air better? Introducing: The Germies & Friends! Improving Your Indoor Air Quality: Are Scented Candles Putting Your Health At Risk? All Ultravation® products are Made in USA.